The personal injury sector has been a “huge success story”, the Solicitors Regulation Authority’s (SRA) executive director of strategic planning and performance has said, but the regulator wants to weed out the bad conduct that exists from claimant and defendant lawyers alike. 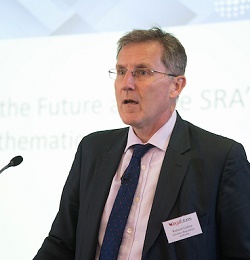 Richard Collins told last week’s PI Futures conference that the thematic review it was carrying out was “timely” and “unsurprising” given the amount of change that had hit it in recent years. He said that “in many ways” the sector has been “a huge success story”, with significant growth and by securing compensation for large numbers of consumers. The review, he stressed, did not mean that the SRA viewed it as a “bad sector or a sector in trouble”. Mr Collins acknowledged that the vast majority of claims taken by solicitors were “perfectly legitimate, good cases and are handled well”. But he said it was in the interests of high-quality firms and consumers to make sure poor practice or behaviour that harmed consumers or public confidence in the profession, was dealt with in a targeted way. The outcome of the review, he suggested, should clear up some of the “noise” in the sector and enable high-quality firms to carry on operating. Mr Collins highlighted three strands to the review. First was solicitor behaviour, and whether there was evidence of fraudulent cases, under-settling of claims or inappropriate delay tactics from defendant firms, such as continuing to defend cases where the evidence suggests the only way forward is to admit liability. Interaction with clients will also come under the spotlight. Mr Collins said there were indications that some firms were progressing cases without instructions from clients and regard cases merely as “things to be processed almost regardless of the views of the client”. The second was practices and infrastructure changes, such as compliance with the referral fee ban, the operation of alternative business structures and use of the MedCo portal. The final strand was solicitor competence, such as poor case selection and triage. “As an example, a number of firms have bought in occupational disease cases but a failure to progress the cases, due to a lack of technical and legal knowledge, has resulted in a proportion of cases reaching their limitation date. Other issues included failing to obtain relevant evidence, not understanding or acting upon instructions, and a lack of legal and case knowledge. Mr Collins said the research will be published in October, with firm engagement, which started in August, continuing until October. The SRA expects to make its conclusions in December before publishing what it will do early next year. Responding to a question, Mr Collins reiterated that when the new SRA code of conduct was published, there would be a specific provision banning cold calling and prohibiting solicitors from accepting cases generated by individuals who have engaged in such behaviour, following the outcry over the possibility that the rewrite would not include this. He added that it would help if claims management companies were obliged to adhere to the same standards.